A murder inquiry into the Bloody Sunday killings in Derry is to begin in the new year. 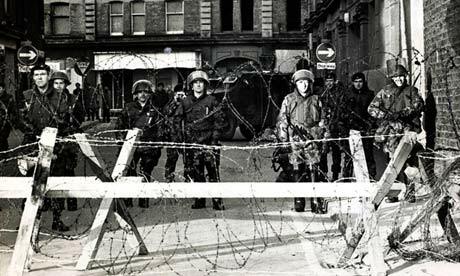 Senior commanders from the Police Service of Northern Ireland on Thursday briefed relatives of the 14 people who died after British paratroopers opened fire on demonstrators in the city, in 1972. Earlier this year, police signalled an intent to investigate the incident after they and prosecutors reviewed the findings of the Saville public inquiry into the controversial shootings. Until now it had been unclear when such an investigation would start. After the 12-year inquiry, Lord Saville found that the killings were unjustified and none of the dead posed a threat when they were shot. That contradicted the long-standing official version of events, outlined in the contentious 1972 Widgery report, which had exonerated soldiers of any blame. The Saville inquiry prompted David Cameron to apologise to the relatives. Thirteen people died on the day, with a badly injured man dying a number of months later. The PSNI's Deputy Chief Constable Judith Gillespie and Assistant Chief Constable Drew Harris outlined details of the murder investigation to the Bloody Sunday families in the city on Thursday morning. Police have said the investigation will be lengthy and complex. It is expected to last at least four years. Statements given by witnesses to the Saville inquiry cannot be used as evidence in criminal proceedings. Police have therefore urged those people to come forward again to make official statements.